You run a website, or maybe you just have files on your computer and you need to get them up to your webserver that’s somewhere in the cloud. 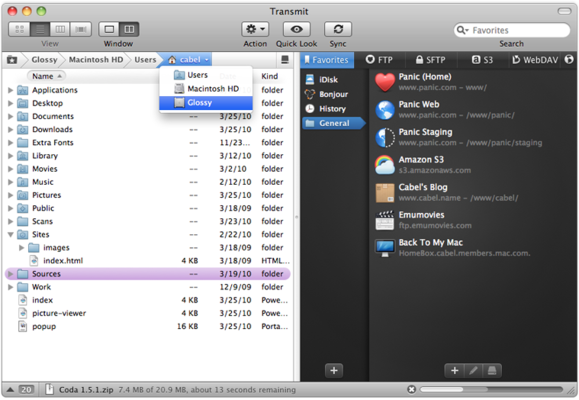 Transmit 4 (Mac App Store link), an FTP client from Panic, is one of your best options for making that journey there and back again. In simplest form, Transmit makes the process of moving files to and from your FTP, Amazon S3, or WebDAV server feel as familiar as working in the Finder. You get two panes—your local files on the left, your server on the right—and you can drag and drop files, use Quick Look on supported remote files, and organize all your websites and servers in folders to stay organized. Transmit is jam-packed with file transfer features for the 21st century, but presents them in a surprisingly easy and accessible package. Give the free demo a try, as I think you’ll find it’s well worth its price.